Your Lawn will never look great if it's not healthy. Don's Lawn and Landscaping provides weed control and fertilization programs that will make your lawn thick, lush and weed free. We also renovate old worn out lawns as well as new lawns that are not as thick as they should be. The best news is that we are able to offer these services at a lower price than most of our competitors. You can control your weeds and have a beautiful lawn for less than 1 penny per square foot (based on a lawn 5000 square feet or larger) ! 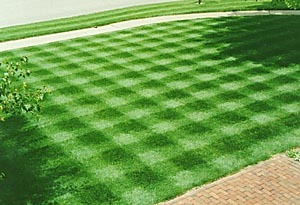 In addition, many lawn treatment companies make unnecessary treatments to generate revenue during slow times of the year. They have to because it's their only source of income. We don't over treat your lawn. We will help you choose a program based on the current condition of your lawn that will make it look its best and at a price that you can afford! Core aeration is the process of removing one to two inch plugs of soil from the ground to allow air, moisture and fertilizer down into the root zone. Many times there is no evidence of insect or disease activity in a lawn, yet the lawn seems to be off-color, thinning and shows signs of stress. If this is the case, chances are your soil is compacted and needs core aeration. Turf soil should be aerated at least once a year. Core aeration is one of the best kept secrets to a beautiful lawn. There are times when a lawn is in poor enough condition that the best way to combat the problem is to renovate. The renovation process consists of over seeding the area by use of a slit seeder or similar devise, core aeration of the soil and a proper treatment program. Seeding of new turf areas and sodding are also available. No matter how bad your situation may be, we can help you fix it and get on the road to a beautiful lawn. Call us, email us, or click on the request a quote link. A beautiful lawn is just a phone call away!